TASKey's own Distributed Management method makes working together easier, agile and more effective. 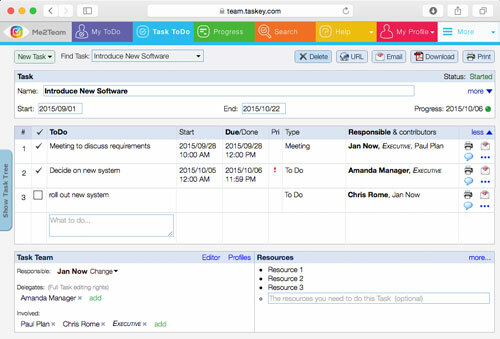 TASKey WorkNav (previously called Me2Team) software ensures that individuals and teams consistently apply the method over an Intranet or the Internet. Online users simply enter critical task information, and then TASKey WorkNav transforms this information into powerful plans and business processes. During your implementation phase, TASKey WorkNav handles the coordination and keeps users informed of what they need to do and changes that affect them. TASKey WorkNav is a general management tool for individual or teams managing their work through web browsers and mobile devices. Integration and coordination of strategies, projects, changes, on-going tasks, actions, ToDo's, teams (including virtual) and individuals is now achievable with TASKey WorkNav. Click on Free Sign-up to start using WorkNav today.